My community building process of engagement across borders and nations, across socio-economic, racial and gender lines has helped me to refine my pedagogy. I look forward to the opportunity to bring all the interdisciplinary and my transborder and transnational experiences I have accumulated over the years to the classroom at UW-Bothell. As a diasporic filmmaker, multimedia artist, writer and philosopher, I engage the intersectionality of marginalized communities in ways that defy expectations of the dominant culture. When we, the scholars, activists and artists, put our own liberation at stake next to those who suffer from disenfranchisements, we find leadership and wisdom in the very marginalized population we seek to assist. These particular agendas are not only at the forefront of my scholarly endeavors; they are very much embedded in my overall teaching practice. In my classrooms, I ask students to think of themselves not only as learners but encourage them to be media producers of change. I therefore stress that key to their storytelling practice is an attention to audience, message, creativity, and intent. As the instructor, I supplement the theoretical with the practical and work closely with students so that they are comfortable with filmmaking as a multifaceted technical practice and artistic mode. I also focus specifically on the craft of filmmaking, which involves a serious engagement with cinema history, film criticism, film production, and film review. I then push students to consider the possibilities of film as a medium of social change, reminding them that they are in the unique position as artists, storytellers, and critics. Finally, my expertise in Japanese and world cinema provides a unique access point for students eager to understand the world beyond their own. Because cinema came into existence in the age of global consciousness, it has been frequently utilized to explore the intersectionality of different cultures. Kurosawa adopted Dostoevsky and Shakespeare to create authentic Japanese period films. And his samurai films launched the career of Clint Eastwood (by way of Fistful of Dollars, a remake of Youjimbo), and inspired Lucas’s Star Wars. The Italian neo-realism film Bicycle Thief birthed the rich cinematic world of Indian filmmaker Satyajit Ray, one of the most important cineaste from the 20th century along with Ozu and Tarkovsky. When young French filmmakers revolted against the establishment in the 60s, young Japanese filmmakers responded with their own New Wave. As an engaged practitioner of this intersectional art form, I will be excited to share with students the extensive network of international filmmakers and artists from Middle East, South East Asia, Europe and Africa. Ultimately, I work to provide my students with the critical and theoretical frame works to do ethical, meaningful, and engaging projects. Two principles drive my research and creative endeavors. One is to defy conventional narratives of identity politics through authentic yet strategic emotional engagement with the viewing public. The other is to pursue all forms of expression and storytelling in order to examine the meaning of our existence as both individuals and as a collective. These principles map the course of all my works. These two principles also represent two phases of my development as an artist/researcher. The first, defiance of conventional identity politics driven narratives, arises from my long-standing struggle as an immigrant of a minority group in America. This allows me to address experiences of marginalization as my own urgent issue knowing that it will also affect my own children’s futures. It is based on my belief that my personal liberation in fact depends on the liberation of many others. Aboriginal artist Lilla Watson said it best, “If you have come here to help me, you are wasting your time. But if you have come because your liberation is bound up with mine, then let us work together.” Togetherness brings me to my second guiding principle. The second principle, a search for interconnected meaning of our existence as individuals and a collective, is the most basic reason for humankind to take on any intellectual, spiritual and creative endeavors. This second principle allows me to examine and elaborate on human experiences from the most inclusive and intersectional point of view. This impetus to find meaning between the individual’s struggle and societal issues drive much of my more popular film works. My collaborative media lab Studio Revolt has been instrumental in the pioneering of spoken word videos, merging a cinematic sensibility with a populist form of poetry into online viral content. 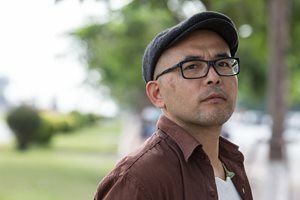 My videos have continued to present narratives from the peripheries including voices from Palestine, the Marshall Islands, Botswana and deported poet and ex-con Kosal Khiev. Cambodian Son, my feature length documentary on Kosal, has been screened around the world reaching a wide range of people from suburban housewives in Oklahoma to street kids in Luang Prabang, all of whom deeply moved by the poet, poetry and ultimately his struggles with injustices. I believe art when experienced with complexities and through compassion can have a far wider impact than other tools of activism. For me, visual story telling with emotional and intellectual resonance is the most powerful antidote to the culture of othering.